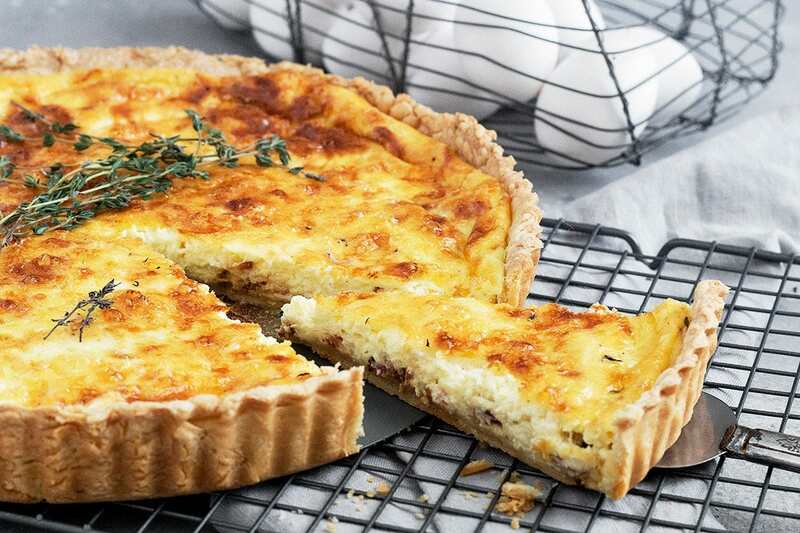 Classic Quiche Lorraine, with bacon, onion and Gruyere cheese, cooked up in a rich cream and egg custard. Great brunch dish! With Easter just a few weeks away, I thought I’d share my favourite thing to grace the Easter Brunch table – classic Quiche Lorraine. I think Quiche Lorraine is the queen of quiche. It’s starts with a cream-based and egg custard and is studded with bacon and browned onion. Then of course, there is the cheese. Nutty Gruyere cheese is such a great flavour and pairs so perfectly with the bacon and onion. It’s a simple combination, but simply perfect. The hardest part of making Quiche Lorraine is the pastry. I’ve included a pastry recipe below if you need one and want to make your own (or use your favourite pastry recipe). Don’t feel you need to make your own pastry, if you would rather not. Store-bought pie shells work just fine. I prefer a shortening-based pastry for quiche rather than a butter one, if you have a choice when buying. Quiche Lorraine is rich enough :) Be sure to use regular pie shells and not deep dish, as there won’t be enough filling to fill two deep dish quiche and quiche is usually on the thinner side, anyway. After the pastry, it’s simply cook the bacon and onions, add the shredded cheese, then pour over the cream/egg mixture. Couldn’t be easier! You can make your own pastry from your favourite recipe or use the one below. Alternately, you can use store-bought pie shells. Be sure to cook the bacon/onion mixture until well done, to avoid limp bacon in your quiche. 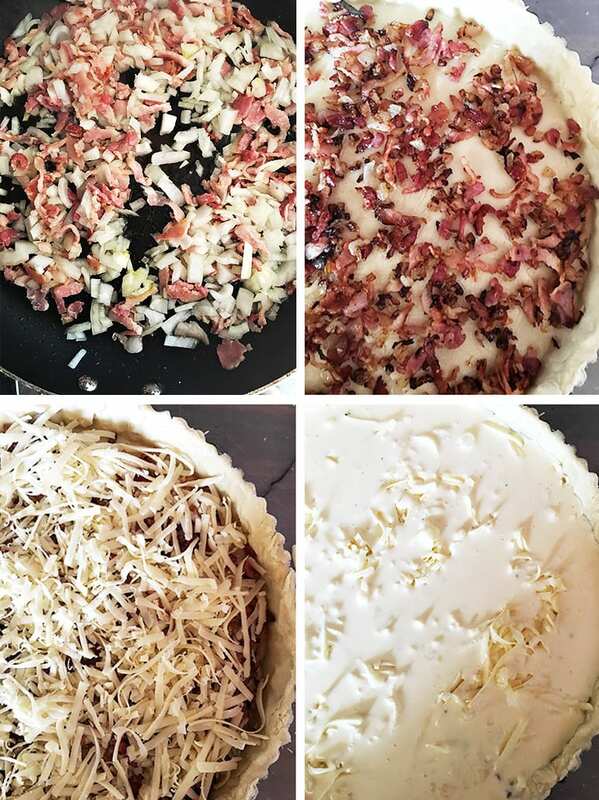 Be sure to allow the bacon/onion mixture to cool before putting into your pie shell, so there is not heat to warm up the pastry before it hits the oven. 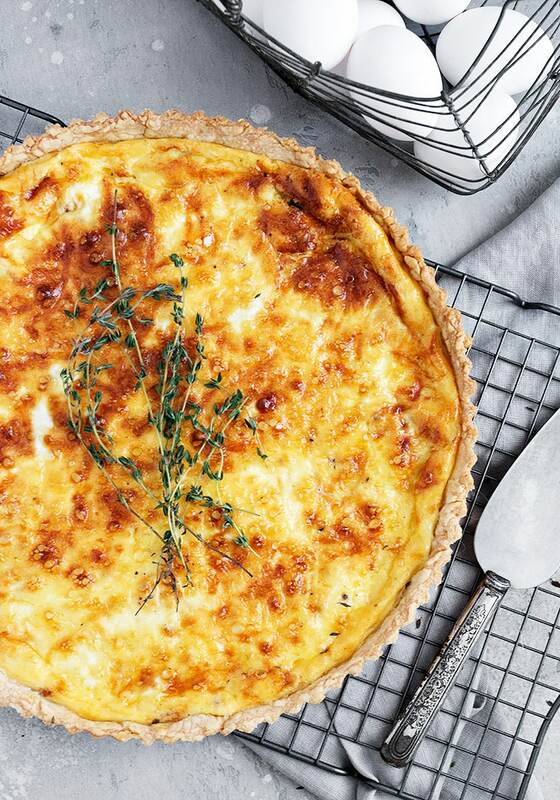 Gruyere cheese is the best for a classic Quiche Lorraine and I highly recommend using it if you can. Alternately, Swiss, Emmental or Jarlsberg cheese would be a decent substitute. This recipe will make 2 regular (not deep dish) quiches or one 12-inch tart-style quiche. A tart tin with a removable bottom is recommended, just to make it all nice and easy. Classic Quiche Lorraine with bacon, onion and Gruyere cheese, baked up in a rich cream and egg custard. Make the pastry: Mix the flour, salt and shortening until it resembles coarse meal. Using a fork, mix in water, one Tablespoon at a time, until dough clings together and cleans easily from the bowl. You do not need to use all the water. Use just enough to make a dough. Gather it into a ball, wrap with plastic wrap and pop it in the fridge for 30 minutes. Divide dough in two if making two quiches, or leave as one ball if making a 12-inch tart. Flour a work surface and roll dough into circle about 2-inches larger than your pie or tart pan. Dough should be about 1/8" thick. Lightly grease the pie plate, then flip the dough onto rolling pin and transfer to pie plate(s). Refrigerate while you make the filling. 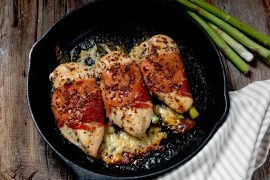 Make the filling: In a skillet over medium heat, cook bacon for 3-4 minutes or until the point where the fat has cooked off, but before it is starting to brown. Add the diced onion and cook together with the bacon, stirring regularly, until bacon is just crisp and onions are browned. Remove from heat. Spoon of the fat and discard (Just tilt the pan and the fat will run to the low point, where you can easily spoon it off). Put the bacon/onion mixture into a bowl to cooled to room temperature. Prepare custard by combining cream and eggs together in a large measuring cup or similar with a spout for pouring. Whisk together well with a whisk or fork. Season with salt and pepper, keeping in mind that there will be some salt from the bacon already in the mix, so you don't want to add too much salt. When bacon/onion mixture is cooled, scatter over bottom of pie/tart shell (dividing between the two if making two regular pies). Top with shredded cheese (again, dividing between two, if making two). Pour custard over-top (dividing, if necessary). Custard may only come about 1/2-2/3 up the pastry side. Don't worry, it will puff up as it bakes. Bake in preheated oven for about 40-45 minutes, or until set and quite golden in spots. Remove from oven and let stand 5-10 minutes, before slicing and serving. I made this the other day and it turned out great! We ate one and one is tucked in the freezer for another day. :) Thanks! I totally agree with you about eating less of something great, than a lot of something mediocre. I’d happily eat a delicious slice of your quiche. 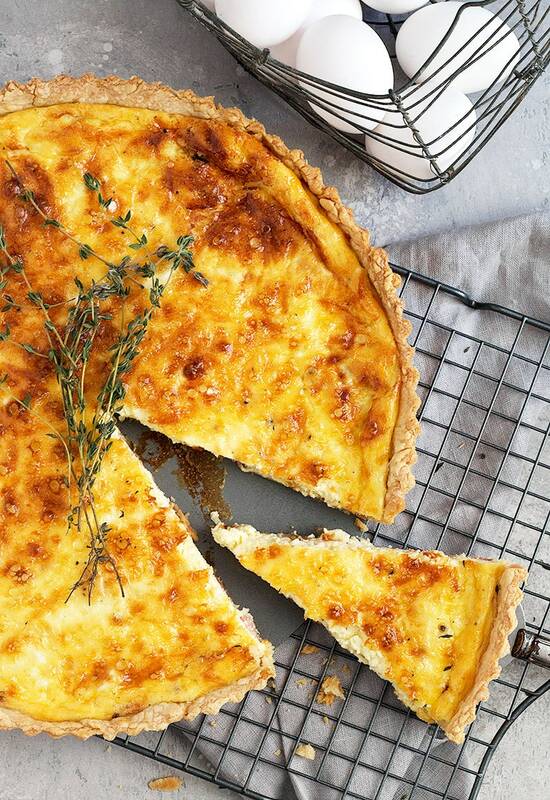 Quiche lorraine is the best, this recipe looks so delicious! I’m a quiche for dinner girl and this looks so lovely Jennifer! Bacon and Gruyere is a killer combo! This happens to be one of my favorite dishes ever Jennifer. I enjoy it for any meal of the day, and so does my husband Tom. So excited to try your recipe! We’ll be home for Easter this year and this definitely needs to be on the menu! Delicious! Thanks Annie :) It makes a great addition to Easter brunch! 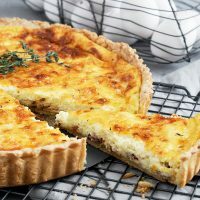 Quiche Lorraine is such a treat, I am with you – better eat less of a great, rich quiche… Thank you for posting this recipe – would love to enjoy it this weekend! I’m so thrilled you are sharing this recipe, Jennifer! I seriously LIVE for a good quiche on Easter and quiche Lorraine is suuuuch a delicious classic! Your recipe looks absolutely PERFECT!!!!! Pinning to make!!! This is such a lovely quiche Jennifer. It’s the perfect brunch favorite – great for Easter or Mother’s Day too! I could eat this cold. 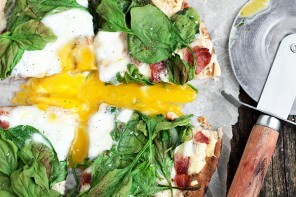 Your crust looks wonderful and all that cheese and bacon is making my stomach growl this morning. 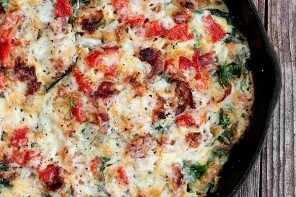 Great recipe and beautiful photos too :) Pinned! Thanks Tricia and yes, I enjoy this quiche year round!